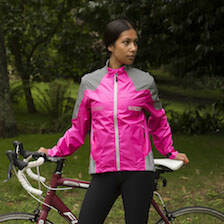 As our range of cycling jackets has grown we realise it can be a bit confusing deciding which one best suits your needs. Each of our jackets offers something different in terms of waterproofing, breathability, cut etc. Waterproofing/breathability: Different jackets offer different ratings. The higher the rating the more waterproof or breathable a jacket is. Cut: The cut or tailoring of a jacket is down to personal preference. If you are purchasing a jacket to use on your everyday commute, then a looser commuter fit might be what you are looking for, but for the performance cyclist then a tighter fitting jacket might well be the answer. It is all down to personal preference and what you feel comfortable in. During certain times of the year there is a lot less or no natural light so if you wish to be seen by drivers in their vehicles then it is reflective material that is the key feature that you should look out for. No matter the brand, make or model, if your outer layer has little or no reflective material on it, then you are making a driver’s task of seeing you more difficult! Below we run through all of the jackets in our range and you can also view our comparison chart here. The REFLECT360 range of cycling jackets has grown since the original version was introduced in autumn 2014. The popularity across the world has meant we have continued to innovate to give you more options in terms of waterproofing, breathability, fit and colour. 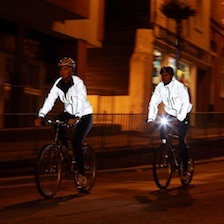 Each of the jackets in the range is made using 100% reflective material so that the jackets (and other products in the range) give ‘astonishing reflectivity’ (quote: Cycling Active Magazine). The stand-out feature of the range is that it utilises millions of retro-reflective beads embedded in the material that light up to appear bright white when a vehicle’s headlights hits the material. This in turn helps the driver identify your position on the road further in advance. We have summarised each jacket in the REFLECT360 range starting with the original jacket launched, and finishing with the very latest REFLECT360 CRS+ jacket, and we also have a running option and one for the Kids too! There is no favourite, and each jacket comes as standard with a multiple features you’d expect of a quality jacket but each one also slightly differs from the next and we’ll try our best to make your decision easier. This is the original jacket in the Reflect360 range, and it is still as popular as ever. 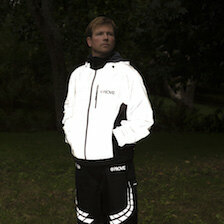 As with all products in the range it is made 100% from reflective material. By day it is an understated grey and by night, every inch is reflective. When launched, this new functionality greatly appealed to many cyclists. Features: Waterproof (5,000mm), seam-sealed, multiple pockets, underarm zipped ventilation, adjustable cuffs, adjustable waist cord, dropped tail, inner lining, waterproof zips, micro-fleece collar. The Reflect360+ cycling jacket gives exactly the same unrivalled benefits as the original Reflect360 Cycling Jacket above but has the added benefit of increased breathability (10,000/24hr) and waterproofing (10,000mm) along with a slightly more tailored fit. Features: Waterproof (10,000mm), breathability (10,000), more tailored fit, seam-sealed, multiple pockets, underarm zipped ventilation, adjustable cuffs, adjustable waist cord, dropped tail, inner lining, waterproof zips, micro-fleece collar. The Reflect360 outdoor jacket is an all-round jacket designed in a slightly different cut to enable the jacket to be used across a range of activities. It has the same functionality and features as the Reflect360 Cycling jacket, but it also incorporates a fold-away hood, it is slightly longer in the front and does not have a dropped tail. This helps to give it the look of a great all round outdoor/leisure jacket. Features: Fold-away hood, waterproof (5,000mm), seam-sealed, multiple pockets, underarm zipped ventilation, adjustable cuffs, adjustable waist cord, inner lining, waterproof zips, micro-fleece collar. We like to break new ground! This jacket was the first ever cycling jacket to be manufactured using coloured reflective material, hence the name (CRS = Colour Reflective System). Up to October 2016 when we launched this jacket, reflective material was only available in the understated grey colour. This jacket comes in multiple colours to suit everyone and has the same great features as 1) Reflect360 Cycling Jacket above. 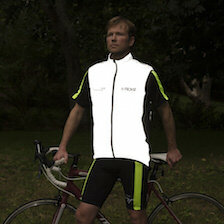 This jacket gives you the best of both worlds; a choice of colours by day, and great all over reflectivity by night. Features: Choice of colours, waterproof (5,000mm), seam-sealed, multiple pockets, underarm zipped ventilation, adjustable cuffs, adjustable waist cord, dropped tail, inner lining, waterproof zips, micro-fleece collar. The Reflect360 CRS Plus cycling jacket gives you exactly the same features as 4) Reflect360 CRS Cycling Jacket, but gives increased breathability (10,000/24hr), waterproofing (10,000mm) along with a slightly more tailored fit and an extra set of side pockets at the waist. Features: Waterproof (10,000mm), breathability (10,000), side pockets, more tailored fit, seam-sealed, multiple pockets, underarm zipped ventilation, adjustable cuffs, adjustable waist cord, dropped tail, inner lining, waterproof zips, micro-fleece collar. To complete the range, the Reflect360 running jacket is designed to be a super lightweight shell to help when you are out hitting the roads in the early mornings or evenings. The jacket is made up of a mix of 100% reflective material and a soft-touch, super comfortable close-knit mesh back to help with the breathability and ensure the jacket is nice and light. This jacket is dual-layered to give great flexibility for day and night riding. On one side, for night riding, it utilises the exact same fabric as the original REFLECT360 jacket to give exceptional reflectivity at night. It also has a yellow or black layer (depending on which colour is for you) that allows you to turn it inside out to give you your day time riding colour. A great 2-in-1 jacket. The Nightrider LED cycling jacket is the first in the range to incorporate machine washable LED lights in to the jacket to aid with your visibility at night and early morning. the jacket is designed to be have a more fitted cut than the original Nightrider jacket and it is manufactured from super comfortable polyester pongee material, which gives great breathability and waterproofing and a high quality finish. Features: Waterproof (10,000mm), Breathability (10,000gm/24hr) tailored fit, high powered LED lights, seam-sealed, multiple pockets, underarm zipped ventilation, adjustable cuffs, adjustable waist cord, dropped tail, inner lining, waterproof zip, micro-fleece collar. The Proviz Nightrider 2.0 cycling jacket is a great all round mid-level jacket that gives everything you require for a jacket that can withstand all conditions. It has ample amounts of reflectivity if you are out at night or early morning and it comes in a choice of colours to suit depending on whether you want eye-wateringly bright ‘hi-viz’ or pink. Waterproof zips, seam-sealed sewing lines and adjustable cuffs are just a few features that come as standard. Features: Waterproof (5,000mm), Breathable (2,000gm/24hr), seam-sealed, multiple pockets, underarm zipped ventilation, adjustable cuffs, adjustable waist cord, dropped tail, inner lining, waterproof zip, micro-fleece collar. When it comes to pushing yourself harder out the roads you may be thinking about softshell which as the name suggests the material is a softer and more flexible material. They offer a bit more warmth as there are more fibres involved and you also get good breathability but you do not get a totally waterproof jacket. During constant rain the water will get through. Many people use softshells for cold rather than rainy weather. The PixElite Performance cycling jacket is manufactured from a mix of polyester, elastane and brushed thermal microfibre to give a warm, comfortable and breathable jacket that is suitable for use year round, with an extra layer during peak winter. The Reflect360 Elite cycling jacket is designed as the ultimate training and performance jacket utilising unique four-way stretch reflective material to give you complete flexibility and comfort. We have designed the arms and body of the jacket using Hydro Alpine 260 GSM fabric that enables ultra-fast drying and through flow of air which helps to regulate your body temperature and gives great insulation on those cold winter days.